Sewing requires a lot of precise fine motor work! 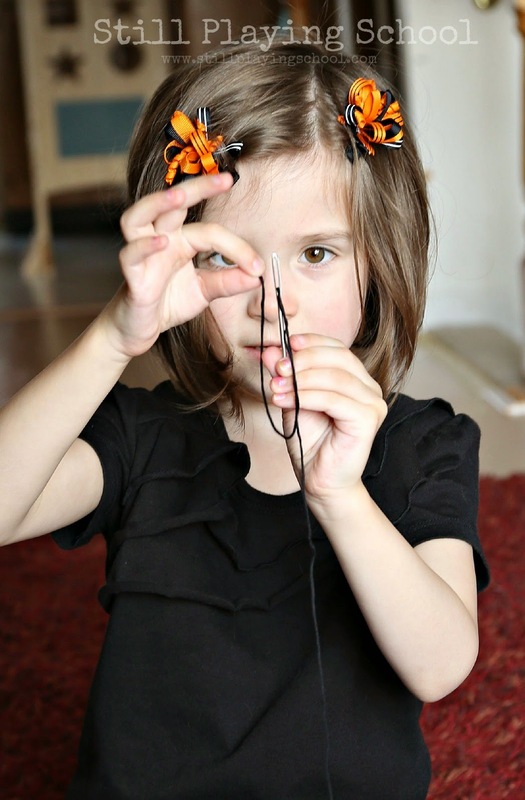 Our preschooler was thrilled with this Halloween themed introduction to sewing for kids. 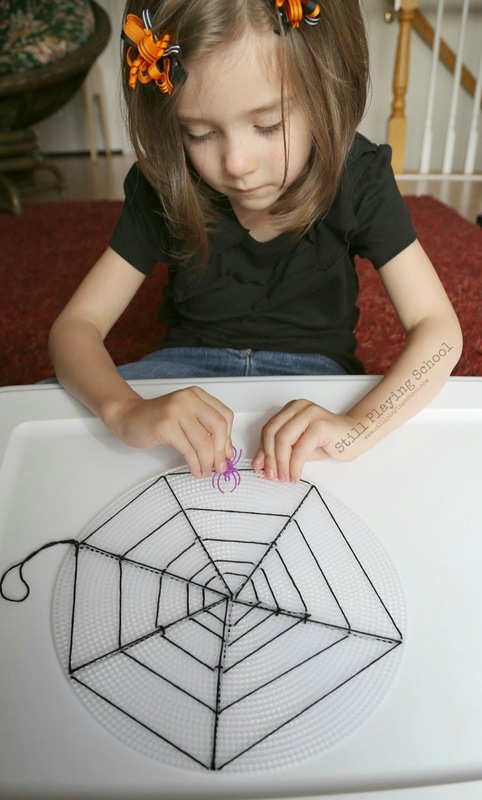 She sewed a spider web! We've been very interested in spiders from our Glowing Spider Webs to our Hide & Seek Spiders in Play Dough. 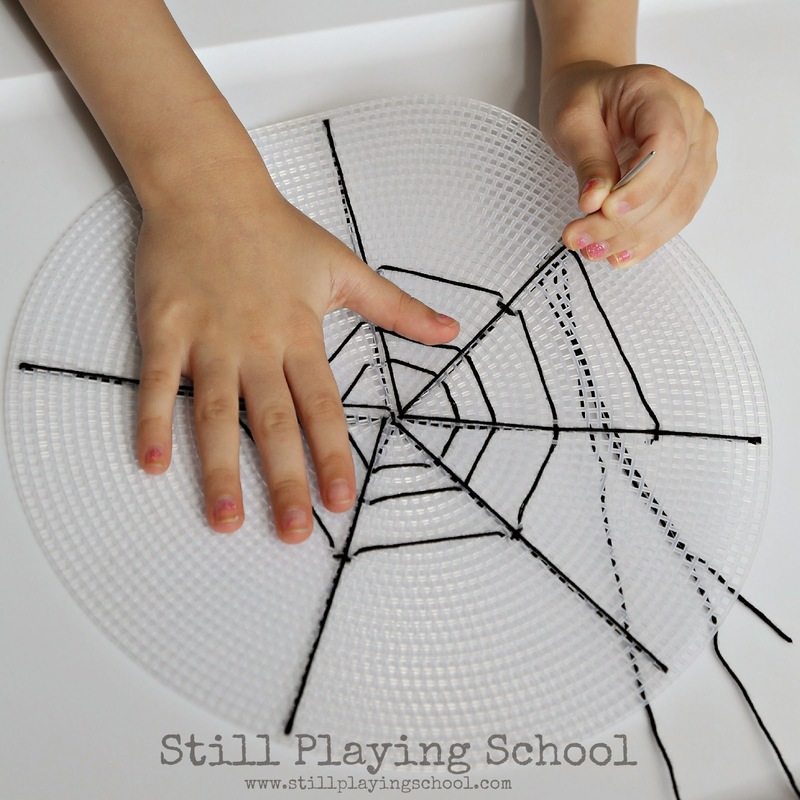 This week we wanted to sew our own spider webs. 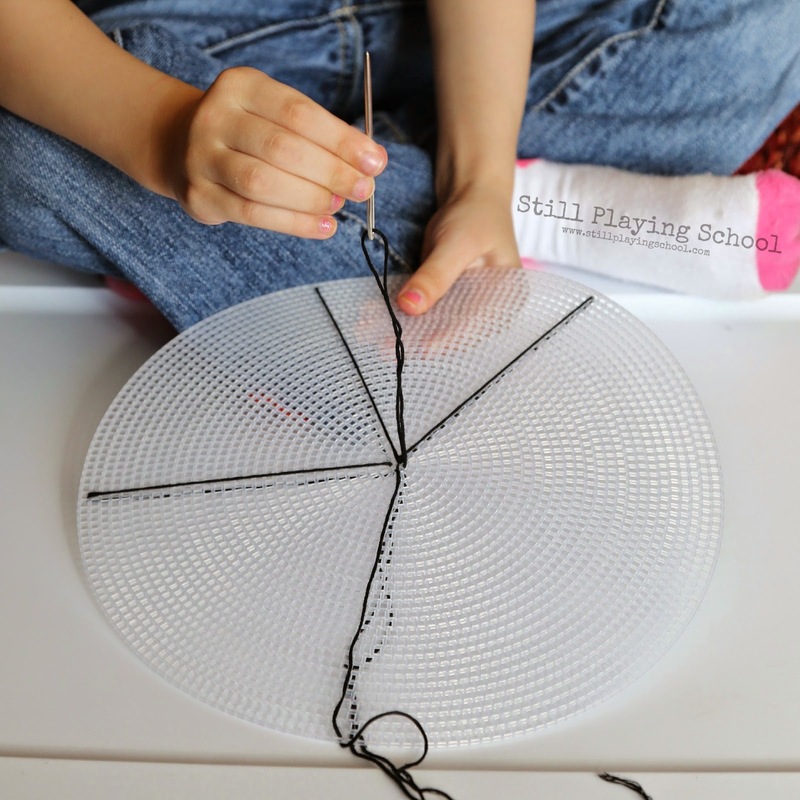 We used a large round plastic canvas but if you're working with a whole classroom of students these smaller ones would be great! 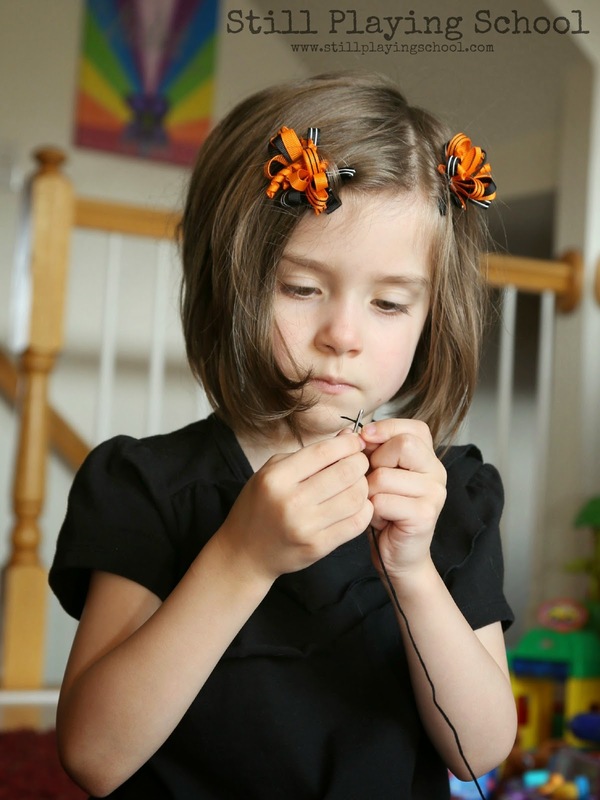 You'll also need black embroidery floss and a kid safe sewing needle. 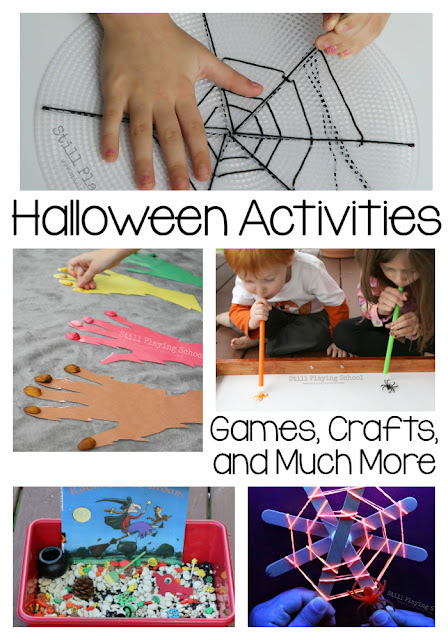 I was thrilled at how interested and motivated our preschooler was with this fine motor task. She was even determined to thread the needle herself. I love the concentration on her face! We knotted the embroidery floss in the middle of the canvas then sewed out to the edges from there. She decided where to space the radial spokes of the web. Sewing requires quite a bit of hand eye coordination. 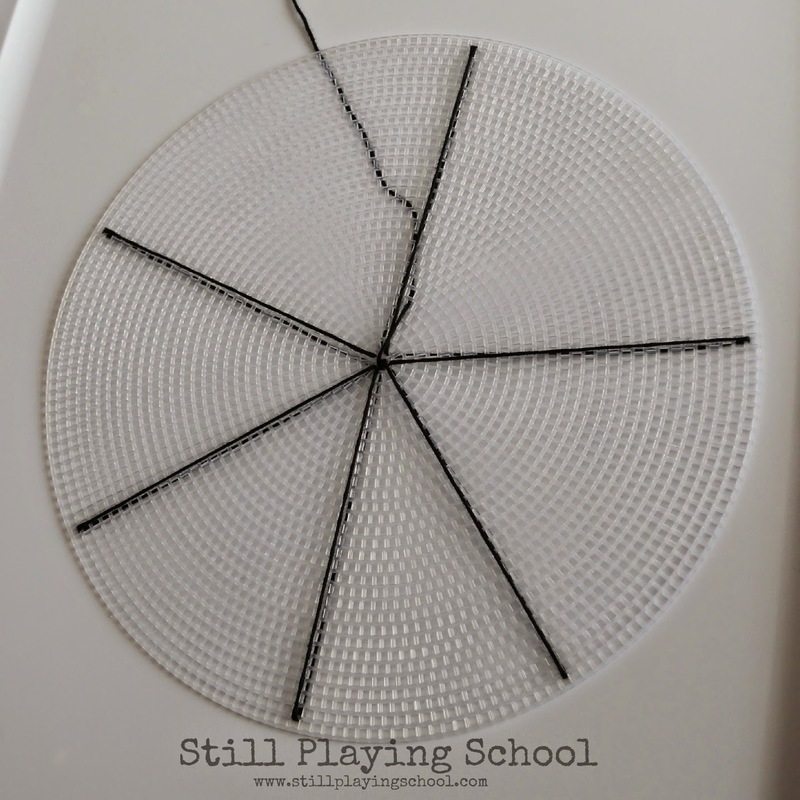 It takes practice to get the needle in the exact spot you want it then fine motor work to push it through and pull it tight! Our preschooler typically gets frustrated with tasks she can't master easily so it was so refreshing to see her continue to work at sewing even when it was a bit tricky for her. I think I need to find more beginning sewing tasks for kids! Once the radial spokes were complete we started back in the beginning forming larger circles spiraling out from the center to finish our web. She had to use her whole arm and shoulder to pull the thread tight. 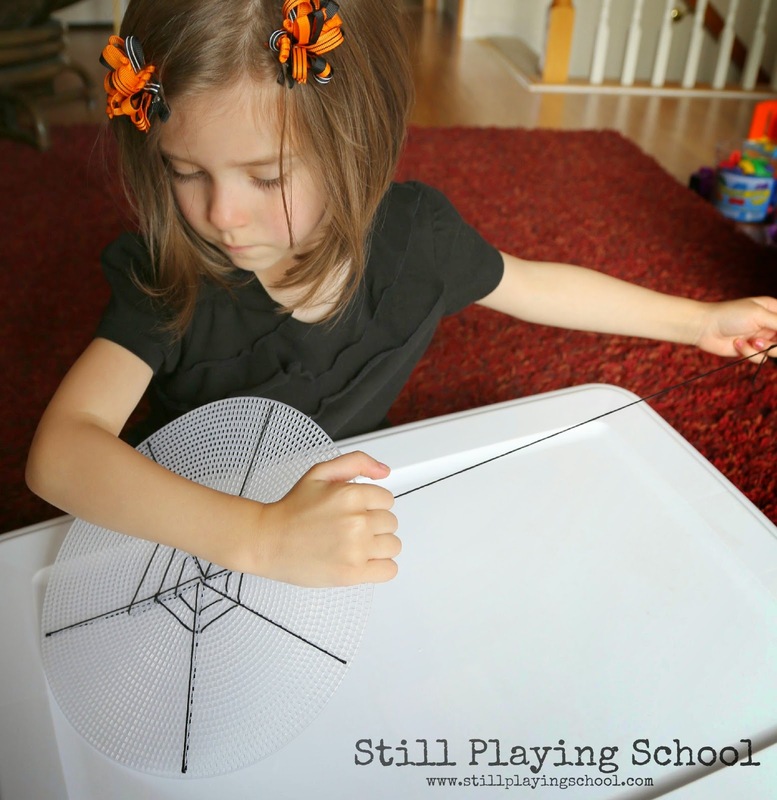 This is perfect for building muscle strength for handwriting! I did assist with an occasional securing stitch around the radial spokes to keep them in place. 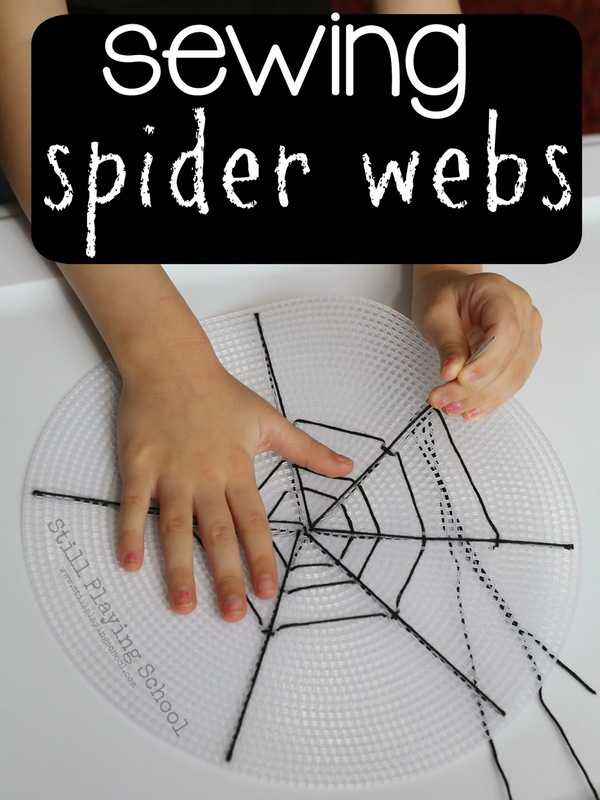 Other than that E sewed the web completely independently! 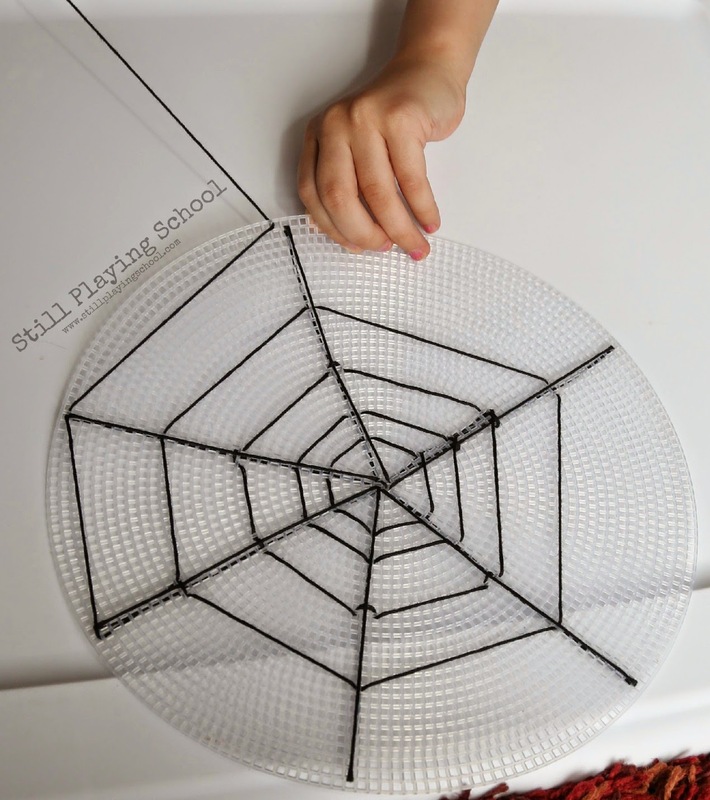 She stuck a plastic spider ring on her web but you might add several more! Sticking the divided adjustable sides of the ring through the plastic canvas was the final fine motor task. If your spider rings aren't adjustable just snip the ring and push it through! She was so proud to hang her sewn spider web on our door. 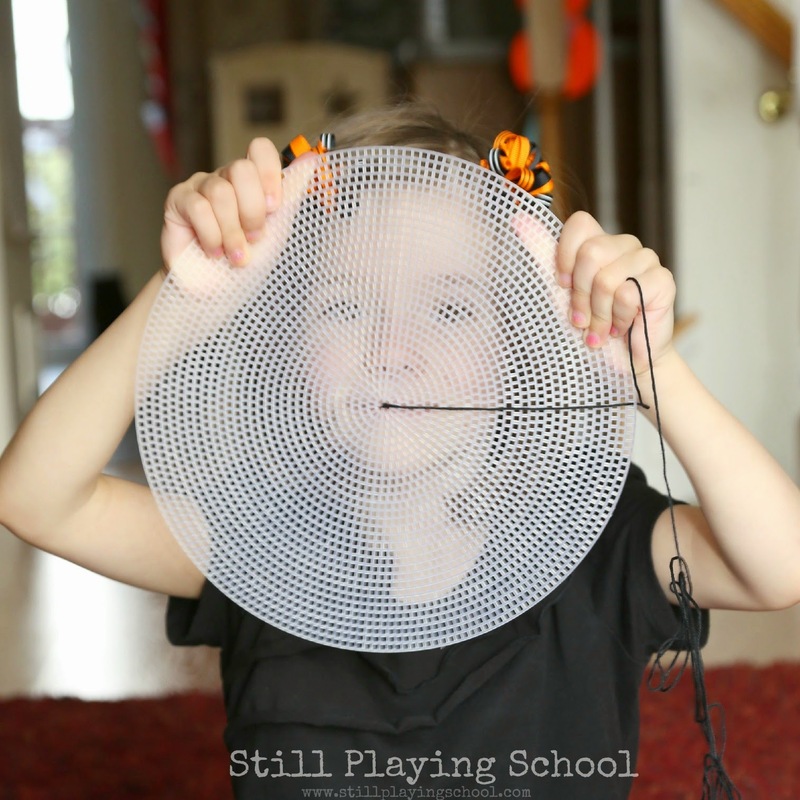 She asked me to pretend we were trick-or-treaters who were spooked away by her spider web craft! This turned out so cute! 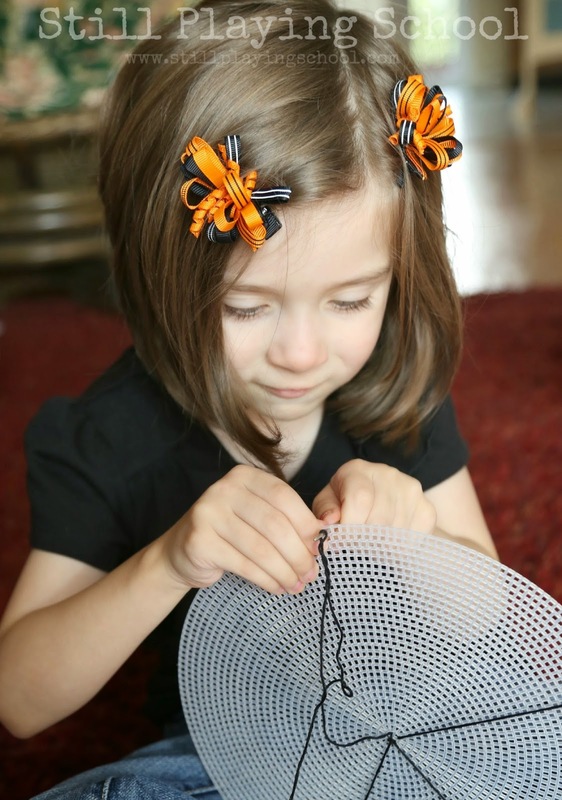 I'm honored that you were inspired by my simple sewing activity! Aw she did so well!